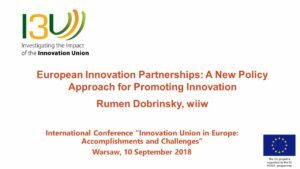 At the September 10 conference on the “Innovation Union in Europe: Accomplishments and Challenges”, Rumen Dobrinsky of the Vienna Institute for International Economic Studies (wiiw) discussed his paper, “European Innovation Partnerships: A New Policy Approach for Promoting Innovation”. The paper, which is due to be submitted for publication in the International Journal of Management and Economics, offers an analytical assessment of the implementation of five European Innovation Partnerships (EIPs). These EIPs were launched as one of the commitments of the EU Innovation Union flagship initiative, with the aim to achieve innovative breakthroughs addressing major societal challenges. The EU launched five EIPs: (1) Active & Healthy Ageing; (2) Water; (3) Agricultural Productivity and Sustainability; (4) Raw Materials; and (5) Smart Cities and Communities. The paper reviews the rationale of introducing the EIPs as a policy intervention and traces their organic evolution and governance structures. It then provides an analytical evaluation of this EU policy initiative based on factual analysis of its implementation experiences and a comparison of its objectives and actual outcomes. In addition, it analyses the role of the EIPs as drivers of systemic change in the European innovation ecosystem and catalysts of new innovation activity in Europe. This critical assessment serves as the basis to draw some conclusions about the strengths and weaknesses of the EIPs as a new policy approach to promote innovation in Europe. One central conclusion is that, while the EIPs have been very efficient in fostering collaboration among innovation stakeholders, they have fallen short of generating genuine innovative breakthroughs. The paper analyses the reasons for this and suggests some possible remedies. This entry was posted	on Tuesday, September 18th, 2018 at 7:31 am	and is filed under Newsletter 4. You can follow any responses to this entry through the RSS 2.0 feed. Both comments and pings are currently closed.